Time flies! I remember attending a family gathering years ago, when I was about 2 weeks from my 30th birthday. As I said, years ago! My Aunt Lucy, who at the time was in her 70’s, told me something I never forgot and live it now as fact – after 30, your years will speed past you so fast it will shock you. Indeed it does shock me as I head into my 60’s. I recently made a promise to myself to gather with as many as my girlfriends as often as possible, even just once every month or so. I will make it point to ‘ink in’ dates with each of them as time does fly. I ‘wanna have fun’ with ‘my girls’ so I have committed myself to do just that! If you feel the same way, get your besties together. 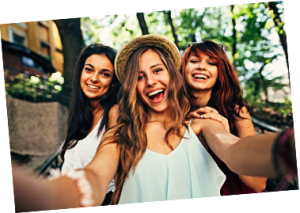 We offer a Girls Just Wanna Have Fun Getaway Package. You and they deserve it! Come and have some fun. Soon!